How do people learn? Take a minute or two to write down as many ways you can think of. 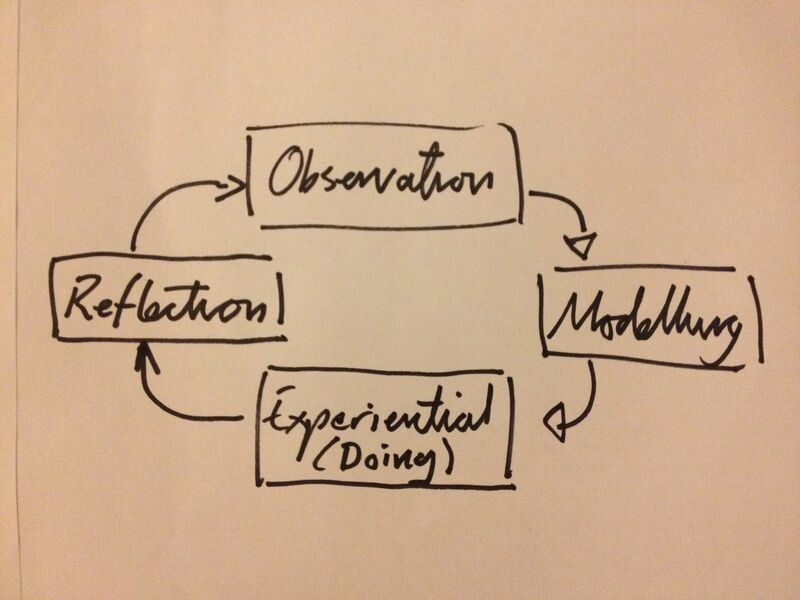 Now consider the Kolb circle of learning. Below is the way I interpret the Kolb model. Now see how the things you thought of fit into the different styles of learning. Observation : Reading, Watching others, Watching videos, Attending lectures, …. Modelling : Creating a model to explain the idea you’ve encountered. Experiential : Doing the thing, pairing. In Nike terms… Just Do It. Reflection: Talking to others to discuss the learning subject. Have you ever thought about the risk associated with different learning styles. 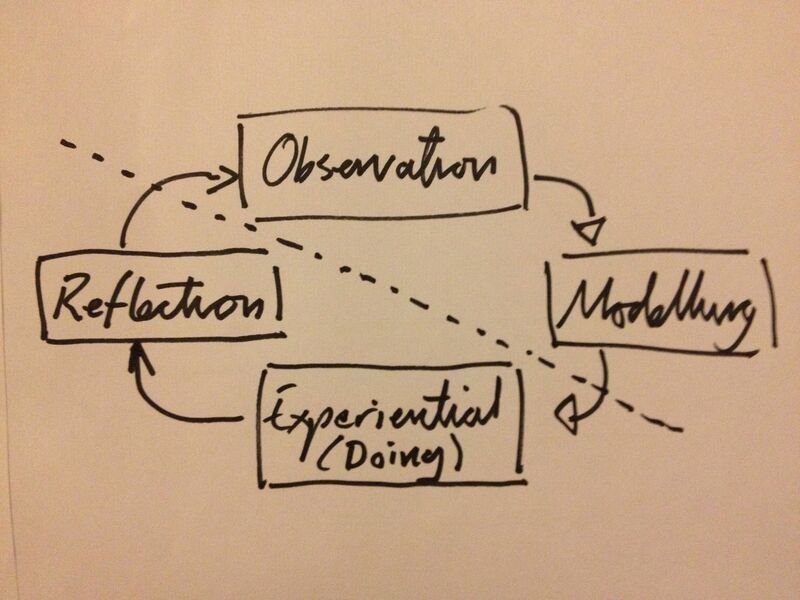 From the individual’s perspective, observation and modeling are the safest options. No one need know you are learning a new subject. You can hide under the duvet reading the book by torchlight. There is also very little chance of failure if you don’t actually try to do it. Experiential learning can knock you back if you find you are not as good as you thought. If you take hours to download an IDE, when you thought you could dance around the code within minutes. That first, ten line, program in Pascal that generates twenty pages of errors when you forget the word “program” at the start. The two hour hunt for a missing semi-colon. Reflection can be scary as you expose your potential ignorance and naivety about the subject. Especially if the class expert / bully ridicules your mistakes. From the team or organisation’s perspective, experiential and reflection are the safest options. Experiential is good because the first thing you do is a simple program like “Hello World”. You then try and do something real that reveals your “… in 21 days book” don’t hack it and you hit Bing ( or Google ). Thirty minutes later you solve it or are e:mailing someone to ask for help (Its never anything profound, normally its syntax). You pick another problem to solve, you hit a snag, and before you know it, it sparks an insight that inspires you to write a blog that evokes a response from world experts. You are a world expert* in approximately 0.0001% of the subject and are completely unaware of 99% of the subject. You also have a healthy respect for the subject and the depths of knowledge required. *An expert in something no one else in the world will ever use, or care about. That’s the beauty of context. You discuss your successes and failures with your colleagues and friends and anyone vaguely interested. You make a joke about your failure and tell everyone. The joke travels and you inoculate your team and possibly your organisation and community against making the same mistake. The guys who are reading books share what they learned, and guide you to the right books to read. Everyone respects each other for the value they bring, especially the world expert in 0.0001% of the subject. There is a risk line I draw on the Kolb Model. On one side of the line is safe learning for the individual in a culture where a fear of failure is dominant. A risk averse culture. On the other side of the line is the place where the organisation needs learning to feel good. Not every individual needs to be on this side of the line but the organisation needs a healthy proportion on both sides to ensure that the risk associated with learning is managed effectively. Just in case you think this is new, Kaplan of Organisational Learning fame said the most important factor in the success of creating a learning community was the leadership’s attitude to failure. This entry was posted on Saturday, June 28th, 2014 at 10:04 pm	and posted in Uncategorized. You can follow any responses to this entry through the RSS 2.0 feed.